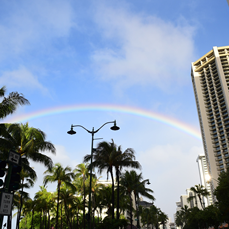 I saw my first rainbow just a few minutes after I arrived in Honolulu, on the way from the airport to the hotel. And so began my adventure in the Rainbow State! 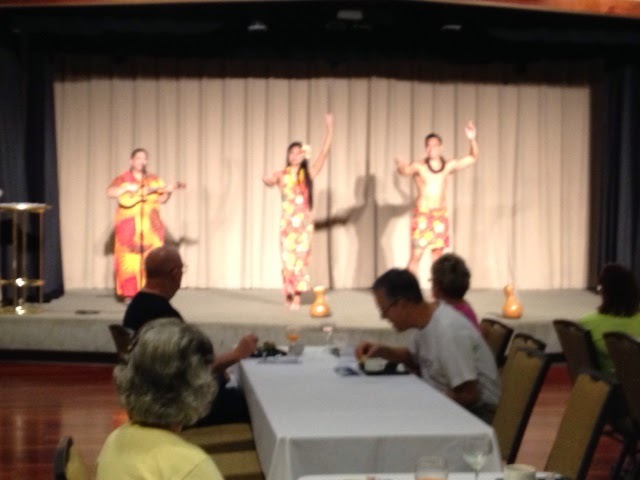 Even before I met my friends, I was officially welcomed to Hawaii. But we showed no fear at the Expo the next day, showing the world we were ready to run America's 4th largest marathon. and also drove us all around Pearl Harbor's base. Helen made history come alive for us as she showed us buildings that still have the bullet holes from the tragic attack on December 7, 1941. When fellow marathoners Abi and Sheri arrived, we took them to Pearl Harbor as well, where we toured the museum and watched the movie about the events of Dec. 7. I drove all of us to the Bishop Museum, a very impressive set of buildings that Charles Bishop, a westerner whose family moved to Hawaii to do good (helping the natives) and did well (made a lot of money), dedicated to his wife Bernice Pauahi Bishop, the last princess of the Hawaiian islands, as a cultural exhibit of the lives of the Hawaiian natives. Next was a harrowing drive through downtown Honolulu. I was the driver, Tina my wingman, and the 4 others squashed in the back seat that was meant for 3 people. Not the most confident driver on strange territory, I was weaving back and forth while my friends were calling out: " left turn on Kailiana street, no, right turn on Lianakai street," while I was shouting back, "but I am in the left turn only lane and aren't I already on Kailiakoliana Street or whatever?? ?," but we finally made it to our destination. And let's not bring up my attempts to park the car outside the restaurant where we were to have our pre marathon dinner. Needless to say, the car was mostly undamaged and we managed to unwind a bit over dinner, as much as marathoners can unwind the night before a marathon. Marathon Day was dark, gloomy, rainy and windy. Very windy! Later we found out the winds ranged from 20-50 MPH. And did I mention we were going to run up and down around a volcano? But we signed up for this, so off we went. And it was only after a few short miles when we were awed by both the beautiful scenery and the amazing spectators who were out cheering us on not only at 5:00 AM but in near tropical storm conditions. And that volcano? Diamond Head was (luckily for us) dormant and spectacularly beautiful. Not that hard to run around. We all became honorary Hawaiians as we finished the trip twice around Diamondhead. Mile 20 of any marathon is a tough mile. For me it means I have around 1 hour left, and if a runner is running his or her best, by mile 20 there isn't a lot left in the tank. 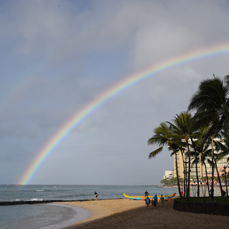 But at mile 20 of the 2014 Honolulu Marathon, a rainbow appeared. 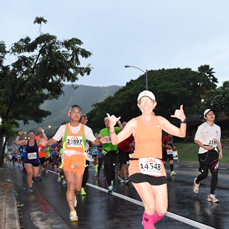 It was as if Hawaii was urging us to continue our run, in spite of the weather. We would all reach the rainbow's end - our finish line. 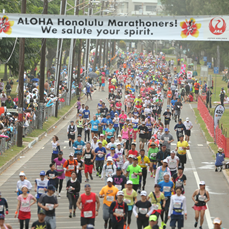 There are a few really cool things about the Honolulu Marathon. 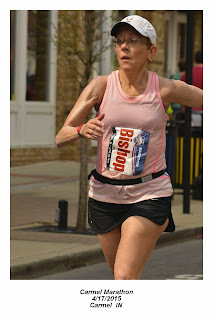 Unlike other large marathons, there is no lottery to enter to run. A runner can wait until the day before the marathon to sign up. 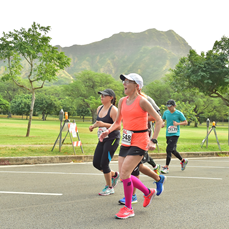 And not only is there no limit to how many people can run Honolulu, there is also no time limit for this race. Every year, the marathon stays open until the last person finishes, no matter how long he or she takes. This year the last runner crossed the finish line in over 14 hours. 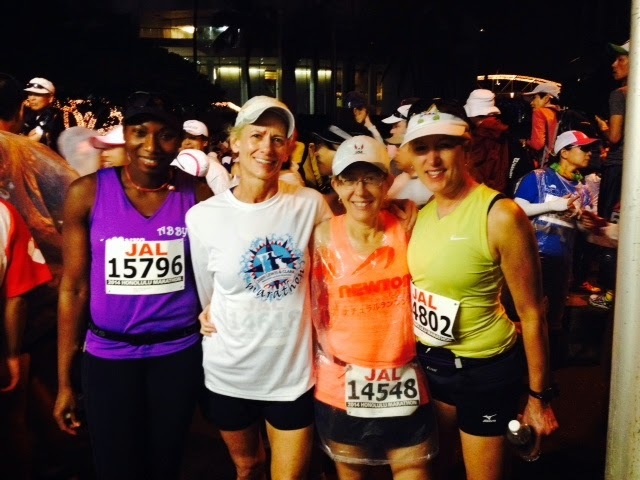 Sue, Sheri, Abi, and I all finished the Honolulu Marathon. None of us ran as fast as we would have liked, but we all had a race to remember, thanks to the support of the volunteers, the spectators, and the race organizers. Their help, and the beauty of Hawaii, kept us going. After the race, it was time to celebrate. I mean REALLY celebrate. There was a bit of a problem when some of us - no names listed here on the Internet! - were kicked out of a restaurant and told never to return. So that was a celebration to remember! 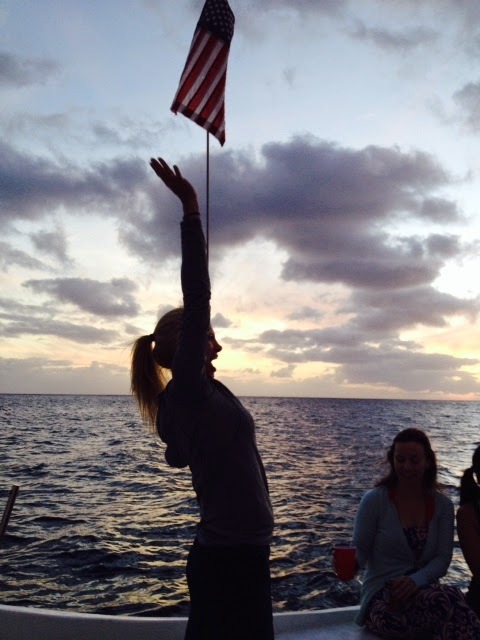 And then there was the post dinner sunset cruise. We sang and danced and regaled the other passengers with our marathon stories. And Sue waved - and waved and waved - at every other passing ship. "I'm a Midwesterner," she said as she waved. "I will wave at any vehicle that passes by me. We are a friendly people." "What will you do if they wave back?" I asked, amazed at her continuous waving as a ship went by. "Bring them a covered dish?" "I'll make them a pie," Sue said, still waving. And then - the passengers waved back! 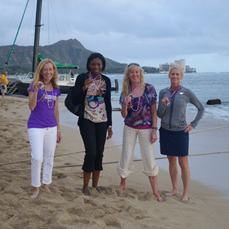 Midwestern spirit reaches Hawaii! The next morning, before I left, I glanced out my window - and there was another rainbow. Another adventure awaits, I thought. More rainbows to chase. I hope for many more finish lines. But it's not the end of the adventure that I look forward to the most. 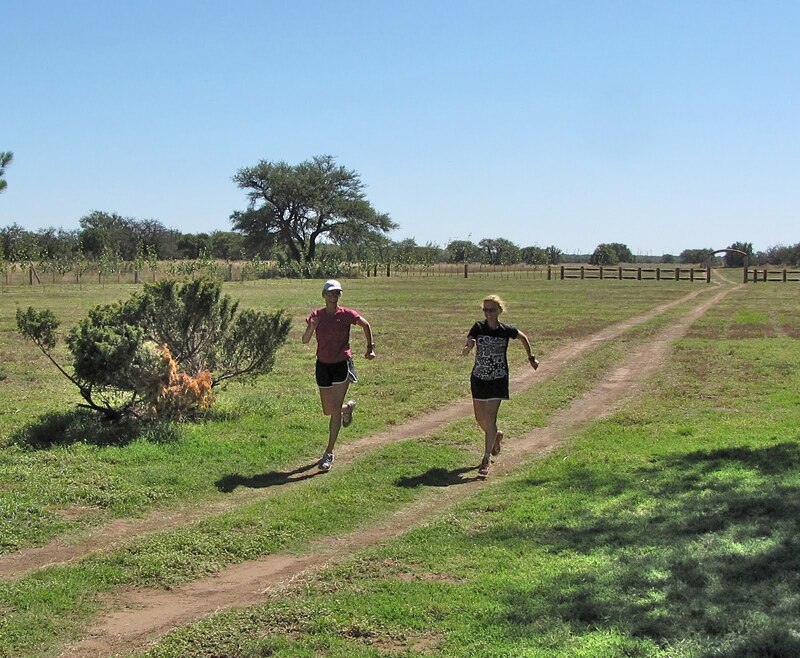 For me, running is about the happiness I feel when I run, the healthier I feel every day, and the wonderful people I meet along the way. If life is like a marathon, then the finish line can wait. I just want to keep chasing the rainbows with my friends.